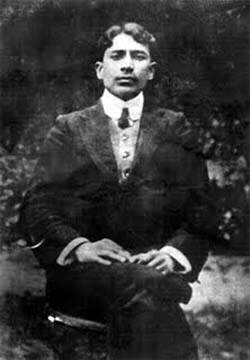 Madan Lal Dhingra was perhaps the first Indian freedom fighter to be executed on British soil. He died in London on Aug 17, 1909. It is strange that no one in the Indian government has paid any attention to the need to commemorate the event. Dhingra was born Feb 18, 1883 in Amritsar into a very rich family. His father, Ditta Mal, retired as a government civil surgeon and had 21 houses in Katra Sher Singh and six bungalows on G.T. Road. Ditta Mal shifted from his village Sahiwal in Sargodha district, now in Pakistan, in 1850 and he held 10 bigha land and a haveli in his ancestral village. He held the title of Rai Saheb, given by the British government. Dhingra's father also had six buggies and his car ran on Amritsar's roads, the first Indian to have this privilege in the city. He had seven sons and a daughter. Three of his sons were trained medical doctors and three were barristers-bar at law. One of his brothers, Bihari Lal Dhingra, was a notorious prime minister of Jind state. It was into such a family that the rebellious son was born. He did physical labor while studying science in Lahore, where he got influenced by the "Pagdi Sambhal Jatta" movement of Lala Lajpat Rai and Ajit Singh, uncle of Bhagat Singh. He later went to England for higher studies, reaching London after two months by ship. Dhingra took admission in an engineering course but quickly became involved in India's freedom struggle. He was influenced by Shyamji Krishan Verma and Veer Savarkar. Veer Savarkar, who was on a scholarship established by Shyamji Krishan Verma, also reached England in 1906, the same year as Dhingra. Both were of the same age group, but Savarkar was inclined to Hindutva ideology. Shyamji Krishan Verma was more liberal and rational in his views, but he had to leave for Paris as the British government harassed him a lot. Dhingra was now under the spell of Savarkar and it was he who inspired him to shoot Curzon Wyle, who was notorious for using Indians to serve as spies in England. The pistol for this purpose was provided by Savarkar to Dhingra, who shot Wyle dead in June 1909. After a trial lasting one-and-a-half months, Dhingra was executed Aug 17, 1909 at the age of 26 years. Bhagat Singh wrote about Dhingra in his sketches about revolutionary freedom fighters. It is the duty of the nation at both the government and people's level to commemorate the event in a befitting manner. Thirty-one years after Dhingra died, another Indian revolutionary, Udham Singh, followed his path in England. He too was executed July 31, 1940, under almost similar circumstances. Excellent read. Thanks to the author and to Boloji for carrying such wonderful articles.